Can you believe it’s already February, the month of Valentine’s Day, the month of LOVE! Before I continue I have a quick question; did you just make a face when I mentioned Valentine’s Day? Or did any good or bad thoughts about Valentine’s Day pop up in your mind? Take a second to think about what you thought. Ok, so this happens all the time! On a normal day we have about 70.000 thoughts, and 95% of these thoughts come from our unconsciousness. This means that we consciously only have “control” over 5% of our thoughts. And probably you are even using less than that 5%, because of all the distractions of the worldly things. We live in a world that so much is expected from us on a constant basis. This feeds our fears and the rest of our “dark” side. Fortunately you have the power to consciously choose to feed yourself with light, positivity, clarity, new energy, and practically everything you need in your life! With the Self-Love + Affirmations challenge I am giving you a push to the right direction, and you will experience a magical shift with these easy tools. I know you are busy, but let’s take 3 minutes a day to consciously practice self-love, ok? I’m so happy that you are smiling and nodding YES! 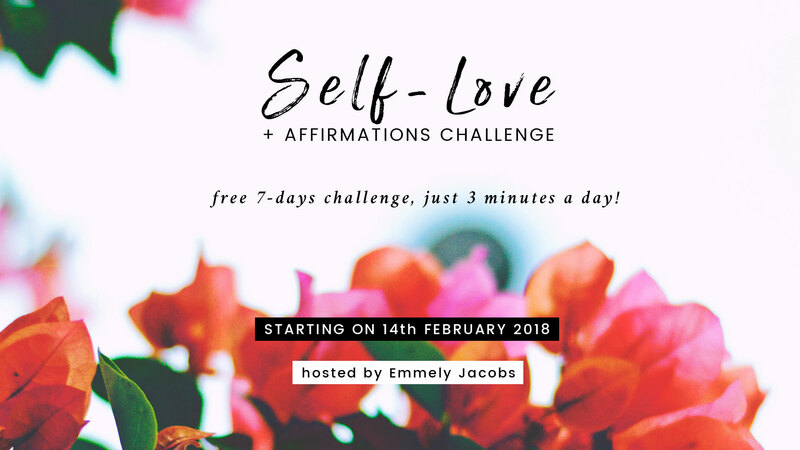 How does this FREE 7 day Self-Love + Affirmations challenge work? This is an online challenge, so you can do this wherever you are. If you register below, I will send you an e-mail on Wednesday, 14th February 2018 with a video and an inspiration worksheet. You don’t need any experience with meditation or affirmations. It’s super straight to the point and I will explain everything in the challenge e-mail! Btw, you can join the entire month of February and start whenever you want, but I encourage you to do it now together! If you register after 14th Feb, you will immediately receive the challenge details. The preparation day, the day you receive the e-mail, will take about 10-15 min of your time. The other 7 days will take a minimum of 3 minutes a day. Since I want to make this as easy as possible, you can even do this in your pajamas in the morning. Just make sure you can sit in a quiet space. For the preparation day you need pen and paper. You can use your journal if you have one. You need a timer! You can use any, but I use the free Insight timer on my mobile which I love. Add me as a friend so we can motivate each other (search for Emmely Jacobs). ….. is the commitment to yourself of making time for some self-care! You are important! By giving yourself what you need, you will be able to give freely to others and lighten their day up too. If you are joining, please REGISTER below. Share this with anyone who could use a bit of light and happiness in their lives. PS. DUTCHIES!!! If you prefer to do this challenge in Dutch, please click here. Hi Emmely, started today! My affirmation is: Ik wil een planeet zijn in de warmte van de zon, die in zijn eigen baan blijft, wat er ook gebeurt.